A bit of a theme play here. I decided I'd try a 'even' match up game based around the Champions and the new Heroic AI type, and at the same time do a little experimentation to see exactly how powerful Champions can be. The AI gets 2 Homeworlds? I'll pick 2 Homeworlds. The AI gets a bunch of Champions? I'll get a bunch of Champions. All 8, in fact. AI doesn't colonize worlds. Therefore, neither will I. Only exception to this will be the absolute minimum number necessary to take down the CSGs. 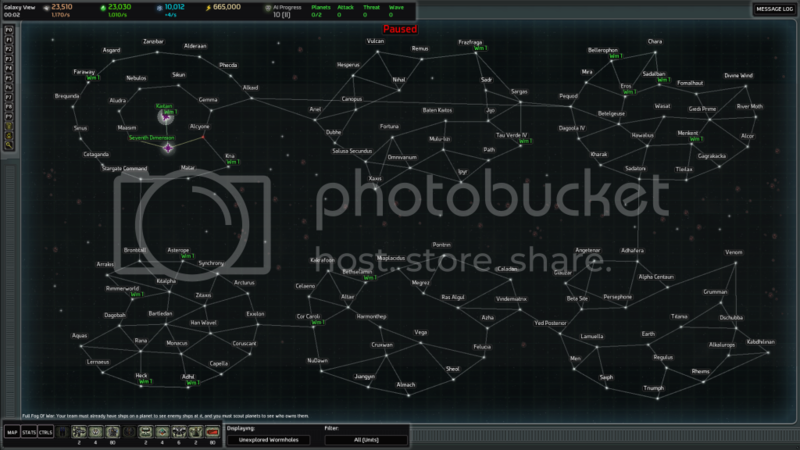 To get the maximum number of available scenarios, I picked a 120 system map. Ok, my HW picks allowed for only 1 exposed system, and my starting types were ZBombard and Space Tank. Ok, not bad ships, so let's run with it. Ok, not bad. Some close nebulas, and a bunch in the 6-8 hops range. I start out by unlocking HBCs, Grav Turrets, and Harvester 3s. I'll be unlocking Fortresses ASAP, and building a lot of them, so my economy will really need the extra Oophm from the Mk IIIs. 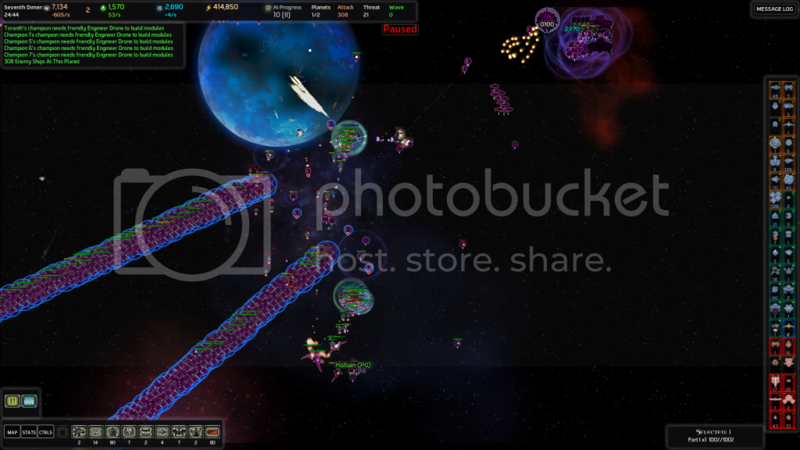 In the mean time, I build a full cap of ships, and lots of missile and sniper turrets. 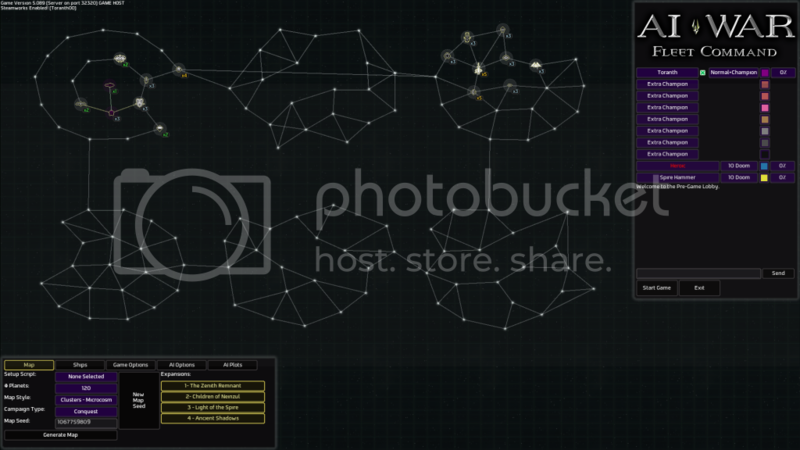 The Champions run around on the nearby systems, killing Guardposts and gathering XP. When they reach level 4, they'll have 3 XP - that's enough to unlock Shields Mk II and Missiles Mk I and Mk II. With that, I can switch to my nebula layout (1 Mk II shield and 1 Mk II Missile module per Champion) and go do a few nebulas. First double wave is about 200 Impulse Reaction Emitters and 200 Missile Frigates. Comes with an extra helping of 1 Spire Destroyer and 1 Human Destroyer with it. Those guys are TOUGH, but with all my defenses, I take them out. Much of my fleet is killed in the process, which is inconvenient. Second double wave from the Spire Hammer comes a few minutes later - Fighters and Chameleons this time. 2 Spire Destroyers along for the ride. Kill 'em, and start the rebuild. I've unlocked Fortresses and started my first one. The Champions are up to level 3, just another 20-30 high level guardposts, and the Champions will be ready to enter the Nebula and start REALLY powering up. That's only 4-5 neutered systems, so I go out there and get busy. And that's were things start to go wrong. See, the Heroic AI type doesn't only add Champions to the waves, it creates an extra Champion or two to 'Patrol' its territory and act as a threat to the humans. Well, about 22 minutes in, I see the number of ships in the system next to me jump, and included in the count is 'Ship modules' and 'drones'. Ok, time to speed back to the HW (aka, Scrap/rebuild) with my Champions: this stuff's about the get real. Yeah, that's 17 AI Destroyer Champions. 17. Destroyers. With all Mk III modules. Including drones. Including Shields. Took less than a minute in total for the AI Champions to utterly crush everything. I didn't even manage to kill a single one of them. 2/3 of them rushed stright to my Command Center, desroying my entire fleet and all my Champions along the way, then destroyed a full double cap of FFs. In about 45 seconds total. I know 10/10 is supposed to be very hard, but this... this was just silly. 17 Destroyers with Mk III modules would be able to do serious damage to a Spire Capital fleet. They could crush golems without even noticing. I replayed this same setup over a dozen times. Always, 17 Destroyers. Always death. I tried building harder defenses - Once I managed to get 2 Fortresses running (but nothing else). Once I just unlocked and build FFs - that made me live over 3 minutes, but I still couldn't kill even a single enemy Champion. Don't even get me started on the time it was 17 Spire Destroyers! *shiver* When all 17 AI Champions were in a stack (most of the time) their shields protected each other, leaving this glowing blue ball, with hot red beams of death spearing out... my fleet, my fortresses... just dust in the (solar) wind. I don't know what mechanic is used to produce the 'Patrolling' Champions, but I would suggest it could use a little tweaking. At 10 AIP - having done NOTHING - this unbeatable death wave is horribly out of place. I did some experimentation, playing a similar game at 9/9 vs 2 Heroic AIs. In that game, the 'patroller' Champions were always 7 frigates. Even as the AIP mounted over 100, it was still - 7 frigates. I supposed if I had gotten to Tech Level II, it would have become 7 Destroyers. This implies that the patroller count and spawn rate is independent of AIP, nebula, or any other human action. And that seems a little off to me. Basing the patrollers on AIP, nebulas won, human system count, time passed, or SOMETHING that allowed them to scale up and for the human to prepare for them would be a dramatic improvement. The free/threat champions spawn once every twenty minutes, and the number spawned is based on the "special difficulty modifier" that's used for hybrid-population-cap, exo-budget-multiplier, etc. That modifier, in turn is based on difficulty, number of human homeworlds, number of human champions, AI handicap. The tech level of the champions (the modules just get that +1, like human champions) is based on the AI's tech level, which is based on AIP (and on diff 10 you start at tech 2, etc). So apparently some of the others got lost somewhere, but the remaining ones were sufficient. Anyway, too high in this case. What would have been in keeping with the challenge? I think 'curbstomp' implies some resistance to the boot. This was more like the AI went for a stroll, and accidently squished the Humans. probably didn't even notice, until the stains got on the carpet. I think you mean 18... which would still be odd, since I replayed (from 1 second into the game to death at 25:00 minutes) and it was ALWAYS 17 Champions. Is there any logging showing the patroller Champion spawn? Also, is that spawn count independent of tech level (aka, does a higher tech level spawn fewer ships, like it says it does with Waves)? But for challenge, that's a more difficult question. In the 9/9 game I mentioned, each AI had 7 frigates running around. When the first group showed up and attacked 20-something minutes into the game, I nearly died. Later on, say around the 1-hour mark, they wouldn't enter the system except with a wave, and while when they did join in it caused many more casualties, it wasn't as risky as that first attack. By the time I unlocked Cruisers for my Champions (around 4-5 hours, probably), I wasn't paying attention to them anymore. 7 frigates? Pshaw, I had more Modular Fortresses than that! In other words, since the count never changed, while it was stressful at first, it was a joke later. For the 10/10 case, 2 Champions joining in on the double waves was killing my stuff, but not seriously threatening me. 4 with a wave would have been painful. 6 probably would have been fatal. Without the 400-ish ships of the wave involved, I suspect I would have been able to handle 6. Maybe. Against Champions, fleetships don't help much - they die in the alpha/beta strikes, giving no more than 2 volleys. So it was really only my turrets and my Champions doing the fighting. So, at minute 20, somewhere around 4 Champions would have been a real threat. But again, if I'd had time to build all 10 Fortresses, those same 4 Champions would have been a much smaller threat. The standard approach would be to scale with AIP, I guess... (I know, not helpful). Yikes. That's basically a Hunter/Killer Mk IV with 2.5 times as many Hitpoints. Zenith Destroyers have 4 Large and 8 Small hardpoints. Large modules seemed to be 3 shields and 1 other for most ships. The 'other' seemed to be evenly distributed amongst all possible modules. Small modules seemed to been even distributed amongst all possible modules. Mostly ignoring multipliers and multi-hit weapons gives a small module DPS of about 13,000 and large module of about 45,000 DPS. 136 small modules, and 17 weaponized large modules. 17 main guns @ 720,000 DPS. 136 * 13,000 + 17 * 45,000 + 17 * 720,000 DPS = about 14,775,000. There were Polarizers and IRE modules present, but the math is too hard for estimates on those. A polarizer shooting a HFF jumps to about 80,000 DPS per module, and an IRE can jump to 45,000 DPS/module though, so the small module average is probably on the low side. Multipliers would increase all other weapons as well, when appropriate. Oh, right, I was suspicious of my math The 17 could be due to rounding in our fixed-point datatype making it 17.9-something, and it only counts whole numbers for this. Surprises you that there's actually some mercy in there, eh? Also, is that spawn count independent of tech level (aka, does a higher tech level spawn fewer ships, like it says it does with Waves)? Yep, it's the same count regardless of tech. Stuff scaling down at higher tech levels isn't universal, though I guess I could do it here. - Divide the spawn by the hull level (there is no fifth hull, so mkV tech level would just divide by 4). - Divide the base amount by 5. - Multiply the end result by (AIP / 50). So that AIP 10 would be pretty tame (with an intermediate result of 1.8, it'd be 1 destroyer per spawn) but AIP 100 would be what you were getting at AIP 10. And by then I imagine you'd have a fighting chance. Of course, there's the other problem of people not even getting to AIP 100 before they're popping AI home command stations, but given that this part of the heroic logic is just gravy on top of what they get in waves, I don't want to be too punishing here. On the other hand, on a single-homeworld, single-champion game (which divides the result by 3, effectively), it'd be AIP 35 or so before you even got 2 champions per spawn on Diff 10, so that may be lower than we want to go. Hard to say. Perhaps I misunderstood you, did you intend to do ALL of the steps listed above? Aka, base amount divide by 5, then divide by 2 for Destroyer, then multiply by (AIP/50)? At 100 AIP, wouldn't that result in 1/5 as many = 3 ((base = 5 * 3.6 = 18) / 5 / 2 * 2) as at 10 AIP now? That would be too low, I imagine. But 17 at 100 AIP... Only one way to find out. As for too easy, try it and see. Maybe up the 'minimum' value to 2. I just tried it a few times, and you can survive 2 Destroyers + a double-wave using nothing more than fleetships and turrets. Just 2 Destroyers should be possible with single HW, no Champions, too. Just remember: 4 Destroyers is roughly equal to an H/K Mk I - Every time you see 4 Destroyers, try thinking 'Is it good to be spawning an H/K here?' and if the answer is not yes, you're going soft you have too many Champions. You could potentially also allow the Special Forces and Strategic Reserve to spawn Champions, too. Since they don't directly attack the human, it wouldn't matter so much if there were more of them. As an aside, ever considered moving 'Technologist' to an AI plot for extra fun? I think a Technologist Heroic AI might be... 'interesting' to play with someday. Perhaps I misunderstood you, did you intend to do ALL of the steps listed above? Aka, base amount divide by 5, then divide by 2 for Destroyer, then multiply by (AIP/50)? At 100 AIP, wouldn't that result in 1/5 as many = 3 ((base = 5 * 3.6 = 18) / 5 / 2 * 2) as at 10 AIP now? -Divide the spawn by the hull level (there is no fifth hull, so mkV tech level would just divide by 4). Ah, right. I think I should stop doing math until tomorrow What I was thinking of was effectively changing the last step to multiply by AIP/10. Leave them there, since the 'Random AI' can still pick them? I could just add a Technologist plot with intensity up to 4 for starting with that many extra tech levels. And then just leave the technologist AIs as they are and if you get a technologist technologist it adds up the bonuses. It'd be kinda like an "I want to die" button, but that describes what an amusingly large portion of our audience is looking for from this game. Adds up the bonuses? Wouldn't that put it above 4? Or am I misunderstanding you? I did it! I survived! 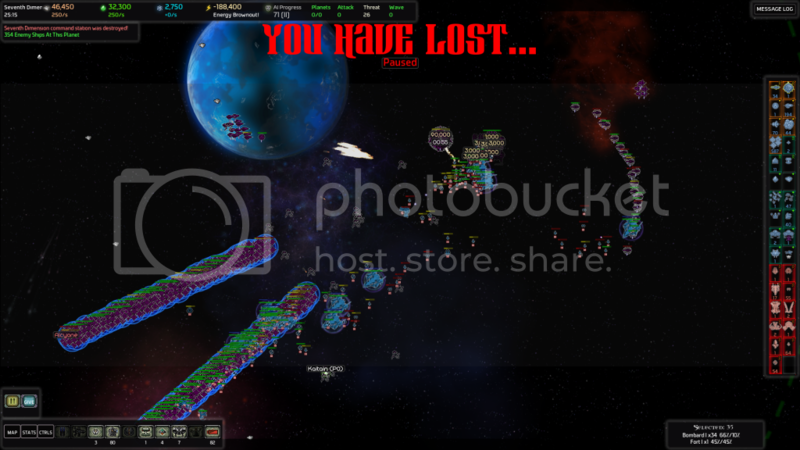 In fact, I survived 4 spawns of 17 AI Destroyer Champions! The trick was to pick Spire Mini-Rams as a starting ship, then pray that the first wave would be Neinzul (no shields). I got lucky, and the first TWO were Neinzul. That gave me enough time to build up my defenses to handle the Zenith and Humans groups that came later. Then 17 Spire showed up on the heels of a large wave, and baptised me in Plasma fire. Oh, well. Time to save scum a bit, and see if I can handle it better this time. May have already doomed myself by not unlocking Mini-Rams Mk II, though. As is, it takes about 40 Mk I rams to destroy a single Destroyer Champion.